Can vegans eat chocolate? YES we can! In fact, vegans can eat Peanut Butter Chocolate Cheesecake, Death by Chocolate and Oreos, Chocolate Pecan Pie, Chocolate Chip Almond Butter Muffins, and more… Are you hungry yet? Clémence Moulaert knows her chocolate like no one else. Born and raised in ‘Chocolate Land’ (aka Belgium), she grew up eating chocolate on a daily basis (and still does) – and she wants to help you do the same. Containing 19 mouth-watering chocolate recipes, plus a breakdown of chocolate-making techniques, this book is indispensable to every chocolate-loving vegan. The measurements in the book are given in metric units and US cup measures. 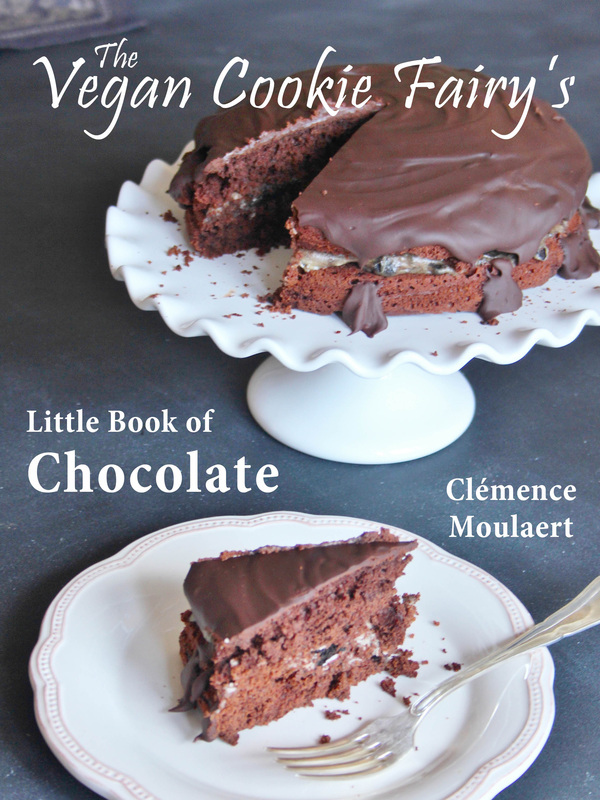 vegan baking and cooking by Clémence Moulaert. "I LOVE the raw matcha truffles!! They were super easy to make and I was surprised at how amazing they tasted considering the few ingredients! Didn't think they could match up to the ''real thing'' but they tasted just as amazing as Booja Booja truffles." "Loved this book. It has a chatty tone to go along with the simple instructions." "Lovely chocolate recipes, easy to follow, good for you & great pictures. Clemence rocks!" "The Raw Chocolate Fudge ... certainly not just for vegans!" Short and sweet – 19 recipes to make your life more decadent and delicious, with tips and techniques to improve your vegan chocolate dessert recipes! Transitioning to a vegan diet in 2011 was easy for me, save for one thing – chocolate. At first I could only eat dark chocolate, or I had to buy obscure, expensive dairy-free chocolate from health food stores, and they didn’t taste that good! To satisfy my cravings I experimented with chocolate dessert recipes, from cakes to truffles. As someone coming from a country famous for its chocolate, it’s no wonder I was full of ideas for a book of vegan chocolate recipes! Tricky question! Probably the Speculaas Chocolate Truffles because it combines Belgium’s best export products (in my opinion). What’s your secret to making delicious chocolate? There is a difference between eating chocolate and cooking chocolate. The latter is often enriched with milk powder or fats to make the chocolate easier to melt, so you must always check the list of ingredients on the packet before you buy, but it is cooking chocolate you should use in baking.